Germinating in soil is the philosophy behind Spongepots and proven to be a predictable tool for growers. Germinating seeds can be difficult, but Spongepots will make life a lot easier. Spongepots' soil is bound by a natural adhesive and excels in usability and predictable results for the grower with higher requirements when it comes to germinating seeds. Of course, we all want the best possible results, but Spongepots truly delivers. Spongepots is the ideal medium to germinate seeds in and have them grow big enough until they are ready to be transferred to their eventual soil pots. The spongepots consist of different types of peat, cocos and potting soil. This adhesive soil mixture has been made into a sponge-like earth pot which is easy to handle and will not disintegrate when transporting to a soil pot. 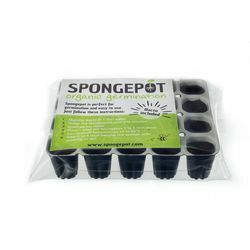 The spongepots are supplied in a convenient plastic tray which ensures that the spongepots are easily accessible to plant your seeds. Spongepots are made with the highest quality requirements which also means that the product has exactly the same quality and composition every time. This makes the production process much more predictable and ensures that your expensive seeds will actually germinate. Due to the small size, they are easy to use in larger numbers and will fit in most common propagators for sale. Having seeds germinate in soil is as nature intended it and also gives the best results, also the seedlings will take less time to catch on since the roots are already accustomed to the environment and can just grow without the shock of having to transfer them. Spongepots are ready for use but depending on the type of seeds you are planning to use, the holes in the spongespots may need to be enlarged. After that the sachet of bacto supplied with it needs to be dissolved in 1 liter of water and use this solution to water the spongepots to make them slightly more moist. The Bacto ensures the commence of the right soil bacteria and the Trichoderma fungi processed therein, has a repelling effect on hostile fungi. Place the seeds in the holes and cover them with loose soil so that the seeds will not experience too much resistance when they are emerging. The spongepots are now ready to go into a propagator and then it’s time to wait for the seeds to germinate.